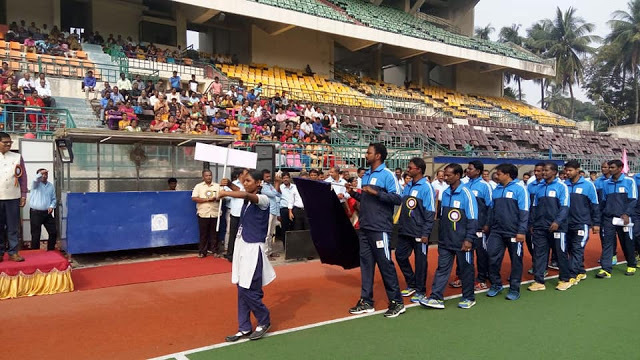 INAUGURATION OF 32nd ALL INDIA POSTAL HOCKEY TOURNAMENT AT CHENNAI ON (21.01.2019) BY THIRU A.N. NANDA, SECRETARY (POSTS). The Postman is the most familiar face and an important member of the society. When people speak about the Department of Posts what they visualize is the ‘Postman’. Postmen remained familiar to us for more than a century and remembered for all the good reasons of joy that they bring along; be it the villages, metro cities or even the remotest parts of our county – they make their presence felt, everywhere, every passing day and touch upon the hearts of millions. Postmen carry great responsibilities in delivering letters, parcels, money orders, gifts and now even the banking services door-to-door. They leave no stone unturned to ensure delivering mail and bring love, joy and affection, in fact, the messenger of all that are part and parcel of the society. This event of installing the Postman Statue may be the first in India and also in the world. This is a great event in the history of Belagavi city and its beautification. 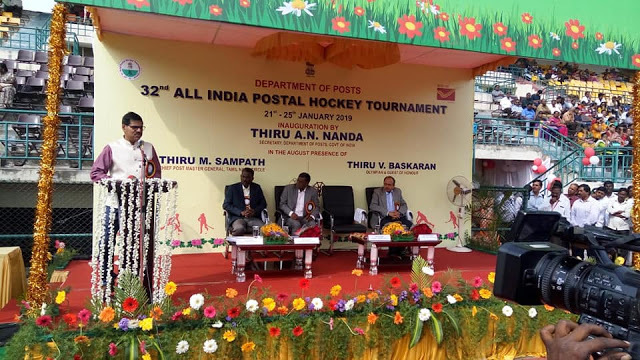 It may also be the great event in the Postal Department’s history to honour the postman staff by installing a Postman statue in recognition of their untiring services rendered. The Supdt. of Post Offices, Belagavi Division and its staff have decided to recognize the services rendered by the Postman staff all these years and have decided to install a Postman Statue in front of the Head Post Office. The Department in consultation with the Cantonment Board have decided to name the circle as “POSTMAN CIRCLE” (junction near Head Post office, Amba Bhavan) and the erstwhile Telegraph Road will be renamed as “HEAD POST OFFICE ROAD”. All the officials and officers of the Department of Posts of Belagavi division have contributed towards the cost of the Postman Statue. Member of Parliament, Belagavi Suresh Angadi, has allotted Rs.5,00,000/- towards the installation of the platform and its beautification to the Cantonment Board. Both the Cantonment Board and the HESCOM authorities have helped the Department of Posts in the beautification of the circle. The Postman Statue is made of bronze and weighing 350 Kg and has a height of 8 feet and made by noted artist Vinayak Manohar Patil. It took the artist 6 months to make the statue. The event of installing the Postman Statue is also a step in beautifying Belagavi City. In the later stage, a small garden and lighting will be done around the statue and the circle. All the members of the public were also invited to grace the function at Belagavi Head Post Office on 13th Jan. 2019 at 1100 hours.